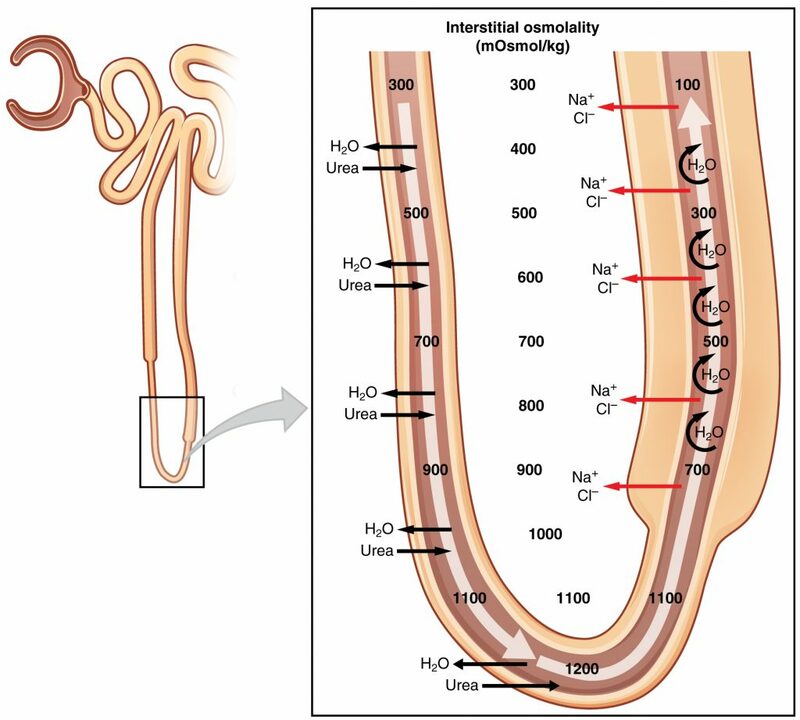 Ion transport along the nephron is essential for the reabsorption of sodium and water, maintenance of plasma volume and blood pressure and production of urine. The Loop of Henle contributes to the absorption of approximately 25% of filtered sodium and can be targeted by diuretic therapy. The Loop of Henle has a hairpin configuration with a thin descending limb and both a thin and thick ascending limb. Ion transport is different in each of these segments. The primary site of sodium reabsorption in the Loop of Henle is the thick ascending limb (TAL). The TAL is impermeable to water. In the TAL sodium reabsorption is active via the NKCC2 transporter on the apical membrane. This transporter moves one sodium ion, one potassium ion and two chloride ions across the apical membrane. A sodium-potassium ATP-ase on the basolateral membrane establishes an electrochemical gradient by pumping 3 sodium ions out the cell and 2 potassium ions into the cell. This not only creates a low intracellular concentration of sodium, but also it makes the inside of the cell negatively charged. Sodium then moves into the cell down the electrical and chemical gradient, through the NKCC2 transporter. Potassiums ions are transported back into the tubule by ROMK channels to prevent toxic build up within the cell. Chloride ions are transported into the tissue fluid via CIC-KB channels. Sodium reabsorption in the thin ascending limb is passive. It occurs paracellularly due to the difference in osmolarity between the tubule and the interstitium. As the thick ascending limb is impermeable to water, the interstitium becomes concentrated with ions, increasing the osmolarity. This drives water reabsorption from the descending limb as water moves from areas of low osmolarity to areas of high osmolarity. This system is known as counter-current multiplication. The thin descending limb does not reabsorb any sodium. In the thin descending limb water reabsorption occurs passively via AQP1 channels. As mentioned above reabsorption is driven by the active reabsorption of sodium in the TAL. Fig 1 – Diagram showing ion and water reabsorption within the Loop of Henle. Bartter syndrome is a group of autosomal recessive conditions caused by genetic mutations in the genes that code for the NKCC2 transporter, apical potassium channel or basolateral chloride ion channel. This results in decreased NaCl reabsorption. As a result more sodium is reabsorbed in distal tubule leading to increased excretion of potassium ions, resulting in hypokalaemia. Also a decreased reabsorption of NaCl results in a reduced osmotic pressure, leading to hypovolaemia. Loop diuretics such as Furosemide can be used to treat hypertension by inhibiting the NKCC2 transporter in the thick ascending limb and increase excretion of sodium and chloride ions in urine. This reduces water reabsorption and therefore reduces plasma volume. Where is most sodium reabsorbed? How is sodium reabsorbed in the thin ascending limb? How is sodium reabsorbed in the thick ascending limb? Which of these is NOT excreted in increased amounts due to Furosemide?